A large group of fast-growing evergreen trees and ornamental shrubs. Many forms have attractive mottled or peeling bark when mature. Originating from the Australian continent, they can now be found growing in gardens all over the world. A number of good forms such as E. gunnii are suitable for growing in the UK, although they rarely flower well or set seed here. Gum trees can reach extensive proportions, even in the UK, but can be kept more compact by pruning. Foliage: Elliptic or sickle-shaped grey-green leaves, strongly aromatic. Evergreen. Flowers: Clusters of small, white, yellow or red scented flowers. Flowering Period: Mid-summer to mid-autumn. Soil: Moist but well-drained soil (chalk, clay, sand or loam). Acid or neutral pH. Conditions: Full sun, any aspect, in sheltered location. Shelter from cold or drying winds. Origin: Mainly from Australia and Tasmania. Hardiness: Most species are fully hardy in the UK (down to -15°C). Plant young pot grown saplings in summer, in any ordinary garden soil that retains moisture but is not waterlogged. Most forms prefer acid to neutral soils, except E. parvifolia. Can be grown as a specimen tree or kept compact as a container plant. Suitable for coastal locations. Eucalyptus have two distinct phases of growth. In the juvenile stage the leaves are generally rounder and smaller and the shape is more compact. In the mature stage the leaves grow longer and thinner, the branches become more pendulous and the bark begins to peel. The young foliage is ideal for use in flower arranging. The pungent fragrance of Eucalyptus oil is a renowned insect repellant. Many gardeners grow one in a tub on the patio to help keep mosquitoes away. Stake, water and mulch well. Do not allow roots to dry out. Apply a general fertilizer during the growing season. No pruning is necessary. Restrictive pruning can be used to reduce the height or to form a large shrub, if required. If cut back hard, many forms with shoot again from the base. If you want a good supply of juvenile foliage for flower arranging then keep the plant pollarded. However, this will obviously stunt the growth and reduce or even prevent flowering. Susceptible to attack by eucalyptus gall wasp, silver leaf and gum suckers. Sow seeds in early spring in a coldframe or under glass. Grow-on in pots and overwinter under glass. 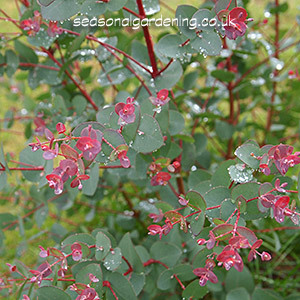 There are a dozen or so gum species that can be grown with good success in UK gardens. E. caesia 'Silver Princess' a compact tree with a weeping habit once mature. Large pink-red flowers are borne during winter. Height to 20ft (6m). E. dalrympleana is an elegant broad-leaved tree with cream, pink and brown mottled bark. Flowers from October to November. Height to 60ft (18m). E. gunnii (cider gum) is the most common garden variety. It has round silver blue leaves, which turn a deeper green as they mature. White flowers can appear midsummer. Height to 70ft (21m). Responds well to pruning and shaping. Available at Gardening Express. 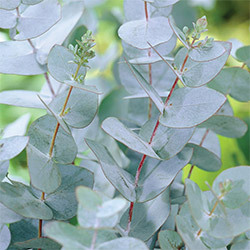 Several good hybrids are available including 'Azura', a more compact version with rich silver blue foliage. Available at Gardening Express. E. pauciflora debeuzevillei (snow gum) has a low spreading habit with beautifully patterned, silvery white bark and large grey-green aromatic leaves. Small, white dandelion type flowers are borne in late spring/early summer. Height to 40ft (12m), spread to 12ft (4m). One of the hardiest of all the Eucalyptus species. Awarded the RHS Award of Garden Merit. E. perriniana (Spinning Gum or Round-leaved Snow Gum) a striking evergreen, producing a good rounded shape with smooth green bark that peels away to cream and brown, creating an interesting camouflage effect. The young foliage is rounded, bluish-green. The adult leaves are glaucous, pendent and lance-shaped. Umbels of creamy white flowers are borne in summer. Height to 30ft (10m), after 10 years. E. niphophila (alpine snow gum) is a compact tree with attractive flaking/mottled bark. Produces blue-green flowers in June. Height to 20ft (6m). E. parvifolia is a small-leaved, tall gum tree, with a spreading head and smooth, grey-barked trunk. Flowers in July-August. Hardy and lime-tolerant. Height to 30ft (10m).